Dogs make the best hiking buddies. Dogs are always energetic. They're happy to be there. They never (well, rarely) complain. And they’ll push you to hike further and harder every time. Yes, dogs love the outdoors. And we love dogs. 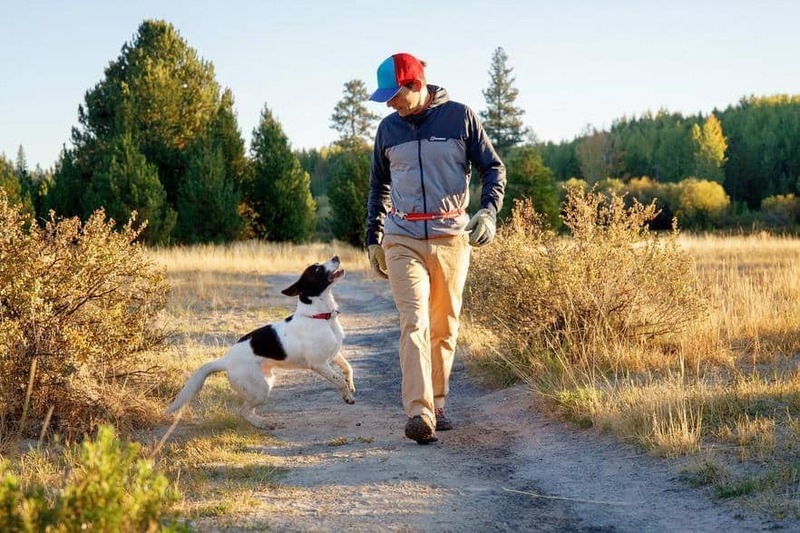 So give Fido what he really wants—a scenic trail, fresh air, exercise and quality time with you. Endless Motivation to get in Great Shape! Dog hiking tip: Going off-leash? Ensure you follow the regs and have a well-trained pup—for the dog's safety and the integrity of the natural areas and wildlife. Grab your pup and jump into this strenuous and scenic trail from the parking lot at Cypress Mountain Alpine Resort. It actually follows the Howe Sound Crest Trail (which continues further into the backcountry) and returns via the Baden Powell Trail, both lengthier rambles that extend across Vancouver’s North Shore. Your dog will need to be strong and active to manage the steep sections of this hike. Keep watch for the remains of a plane crash—a Navy T-33 jet went down on Mount Strachan in 1963 and the remains are still visible. The big payoff on this trail is the Bowen Lookout—an expansive vista even Fido will appreciate. Another great doggy hike starting at the Cypress Mountain Alpine Resort parking lot, St. Mark’s Summit is a challenging linear route that pays off with big vistas over Howe Sound and the Strait of Georgia. Technically a leg of the Howe Sound Crest Trail, St. Mark’s leads from a ski run, to a gravel road and to a woodsy trail as it enters the alpine region. Meander over two wooden bridges and you’ll be into the steep stuff. Your dog should be a capable breed—this is no place for lapdogs. On a clear day at the summit, you can gaze right to Vancouver Island. Easy, lush, scenic, year-round and off-leash friendly—Cypress Falls offers a wonderful woodsy getaway for dogs (and their owners too). Located just a short drive from downtown, off Highway 99 North, Cypress Falls gets you from skyscrapers to Douglas-firs and redcedar tout de suite. An easy, well-maintained trail meanders through the rainforest en route to the cascade of Cypress Falls, which appears in the evergreens about 45 minutes after leaving the parking lot. It’s an oasis in the city; surrounded by development but serene within. Of course, this one has to be pup-friendly. Dog Mountain offers a good mix of length—to help active dogs burn off the kibble—with minimal elevation gain, so smaller pups can manage too. (However, there are some rooty-and-rocky sections.) It starts from the Mount Seymour parking lot and rambles over streams, though woods and atop bridges as you hike toward the summit of Dog Mountain. From the top, the view is classic Vancouver—a mix of ocean, mountain and a panorama of the city. You and your pup might even be able to see your home dog-park from here! Actually a 48-kilometre trail that winds from Deep Cove, North Vancouver, to Horseshoe Bay, West Vancouver, the Baden Powell Trail is a remarkable slice of wilderness travel that’s close enough to downtown Vancouver to be accessible by public transit. 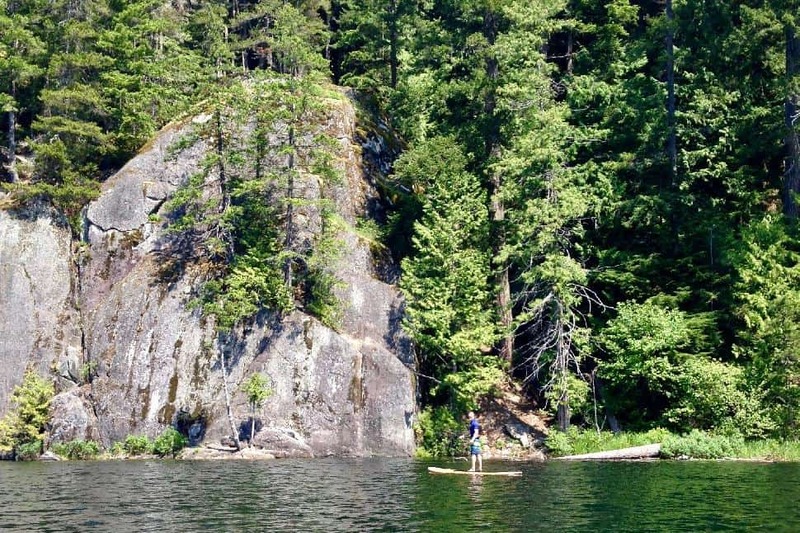 If you and your dog are up for a challenge, the Deep Cove to Lynn Valley leg connects some of the most popular spots—Quarry Rock (see below for the standalone), the lower sections of Mount Seymour and Lynn Canyon. You’ll need to arrange a car shuttle or dog taxi—unless you fancy a 24-kilometre epic day, but Rover might be too tired for that. A quick linear leg of the Baden Powell Trail in Deep Cove, Quarry Rock is a Vancouver-fave for a little Shinrin-yoku. It’s easy to find—just stop the car at Panorama Park and walk further along Panorama Drive to the trailhead. Or follow the crowds—notoriously busy, go before 9:00 a.m. on weekends for the best experience. Most reasonably active pups (and people) can manage this stroll—a short stair-climb leads to an undulating forested path and finishes at the namesake rock with expansive views over Indian Arm and east. The hikes of Lynn Headwaters Park are popular for a reason—lush evergreens, cascading falls, emerald river pools and, if you hike a bit further south, you'll reach a free-access suspension bridge in adjacent Lynn Valley Park (on leash). 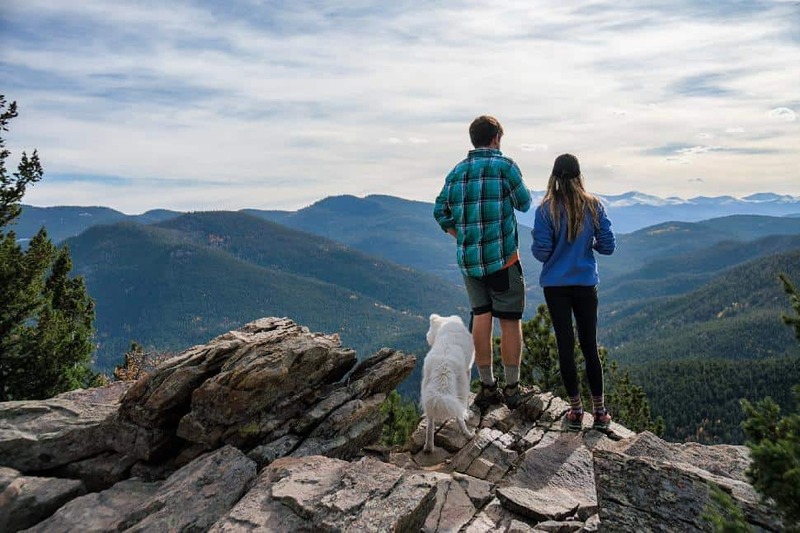 This well-maintained trail network is a great place to introduce Fido to hiking and to socialize the pup with people and dogs—of which there will be many. Weekdays or early on weekends offer the best chances of in-park parking, otherwise you may have to leave the car outside and hoof-it in. Another hike suitable for larger, active dogs and fit-owners, Mount Seymour Summit offers a wonderful alpine ramble with breathtaking views throughout. Accessed from the Mount Seymour parking lot, hikers and pups start the trek by wandering past the ski area and closely following the signs—several other hikes branch off from this area. Things quickly steepen as sweaty switchbacks lead to the alpine. It’s views-a-plenty from here, as a total of three peaks impress with vistas into the vast backcountry in one direction and over the city and ocean in the other. Follow the on-leash rules—steep cliffs and sudden drops abound. Don’t let the short distance fool you. 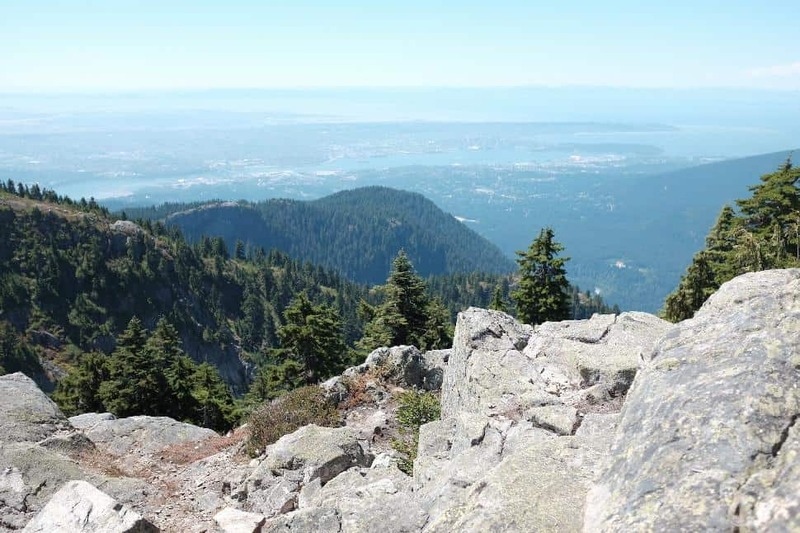 This hike runs alongside the infamous Grouse Grind, and is arguably more challenging. It climbs nearly 900 metres in just three kilometres—so it’s suitable for extremely active, well-hiked dogs (and owners). Bring lots of water. No dogs are allowed on The Grind, so the BCMC Trail is a good alternative for Grinders who want to keep their pups in tip-top shape. This isn’t one of those hikes with big views and picnic spots. It’s fitness through-and-through. The catch: you'll have to hike down too. Only service dogs are allowed on the Grouse Gondola. Lynn Peak is a fitness-lovers dream. At just over four kilometres each way, it climbs more than 700 metres—meaning it’s relentless in its workout. Running for some parts along a creek bed, the footing can be loose, but peekaboo views and towering evergreens keep the eyes as entertained as the feet. Fido will need to be strong and active; though with a fraction of the crowds of other North Van hikes, serene rest stops are easy to take. The payoff is a vista over Mount Seymour and towards Indian Arm from a rocky rest area perfect for a human-dog bonding. Norvan Falls is a lengthy trail, so people-and-pups should be up for the challenge, but the elevation gain is less than 200 metres and it’s well-maintained, so it’s accessible for most moderately active dogs. Plus, once you trod north of Lynn Loop, you can let Fido off the leash (but always under your control—deer, bears and cougars roam the landscape). Evergreens and mountain vistas lead you forward to the waterfall payoff—a frothy cascade and an emerald pool, surrounded by mossy rocks. Give Fido a drink and head back the way you came. 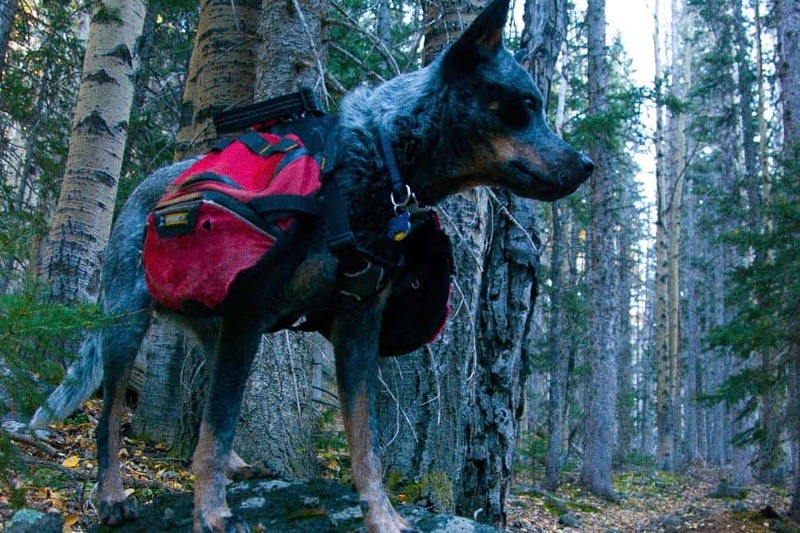 Dog hiking Tip: Train Fido to carry his own gear & food—saddlebags are a must for outdoorsy dogs. Abide by the leash regulations. Often, they're in consideration of natural integrity as well as the dog's safety and well-being. Watch for poison plants—mushrooms and other fungi may top of the list, but a host of other flora will at minimum give your pup an upset stomach. Learn the poison plants in your area. Right of way goes to the non-doggy. When you come across other hikers, stop, heel your dog and allow them to pass. Non-retractable leash, always! Retractable leashes simply don't offer the control you require in the woods. Keep Rover away from sensitive habitat, such as wetlands (or anything off-trail). No digging, no ripping of plants and absolutely no chasing of wildlife. How well do you know your Spanish? Literally translated to “10 Views,” this scenic loop in the Tri-Cities area actually offers just about non-stop views as it loops popular Buntzen Lake and climbs through the lush mountains alongside Indian Arm. Switchbacks reward with views over the inlet to North Vancouver or over azure Buntzen Lake—a popular swimming hole come summer. Certain areas around Buntzen Lake allow the pup to be off-leash, but mostly you’ll need to keep Fido securely attached throughout the lengthy loop. OK, so you and Fido have braved Lynn Peak and the BCMC Trail and you’re still not satisfied? Maybe you have a Border Collie or other energetic breed and you’re looking to challenge your puppy like never before? Welcome to the Sea to Summit Trail in Squamish. An extremely steep and challenging trail, it runs below the Sea to Sky Gondola on its route from near sea level up the side of Sky Pilot Mountain. Your dog should wear a harness, as he’ll often need a boost up some scrambly sections. But the good news is there’s a full-service lodge at the top (craft beer on tap) and you can both ride the gondola back down (fee applies). Brohm Lake is hiding in plain sight along Highway 99, just north of Squamish. Locals love it as it's the first lake in the area to warm-up to swimming temperatures. Parking can be an issue; get there early or you may have to get creative with your car (be safe; obey rules). A gentle, well-maintained trail loops this serene lake, taking you from the noisy highway to the quiet woods quickly. Mostly on-leash only, there are some areas that permit your mutt to go for a swim sans-attachment. The trail around Brohm branches off into a larger network, but the main loop is a pleasure for pups and their people. A short and rewarding trail just south of Whistler Village suitable for moderately to highly active pups, Train Wreck offers a glimpse into the colourful past of the Sea to Sky region. Accessed from Function Junction, then Jane Lakes Road, lookout for the signage and park nearby. A short jaunt into the evergreens leads to a beautiful suspension bridge over the Cheakamus River, then a steep gravel path and eventually an actual train wreck. Mangled (and since graffitied) boxcars litter the forest from the crash in 1956. (Word has it the locomotive was travelling twice the recommended speed.) Get Fido to pose in front of the cars for epic Instagrams. Flat, well-maintained, accessible and easy. Just about any dog (or person) will love the Alouette River Dykes in Pitt Meadows. While the full-length is 14 kilometres, feel free to walk as much or as little as you like. Gaze over the Pitt, Fraser and Alouette rivers, with the Cascade Mountains beyond. Spot livestock in nearby farms. Pick berries, in season. Many side paths lead to the waterways, or scenic rest spots throughout. Owners commonly let their pups off-leash here but with abundant waterfowl it’s good practice to obey the regs. This gorgeous year-round hike is a perfect respite from the urban environments, especially for residents of the Fraser Valley. A mostly level loop around Rolley Lake, expect a well-maintained boardwalk, marshlands, second-growth evergreen forests, lake views and serenity (in the late-fall or winter). Make sure to stop by Rolley Falls before you leave—a small but pretty cascade near the entrance of the trail. The toughest part of getting to Mount Cheam might be the road itself—you’ll need a sturdy four-wheel-drive vehicle to get to the trailhead. Medium- to large-breed dogs will be OK on this trail, as there are often logs to climb over, and it soon gets quite steep as you climb to the epic viewpoint payoff. After passing Spoon Lake, you’ll spend the next hour climbing switchbacks toward the summit. Only well-trained dogs should be off-leash here—there are some steep drops. The final payoff is a ridge with one of the finest views in the Lower Mainland, extending over the Fraser Valley and towards Harrison Lake. You want gear that can do both. Check out the Patroller Dog Leash from Ruffwear: a durable, adjustable leash that you can quickly clip around your waist and slip-snug when it's time for Rover to go sans attachment. 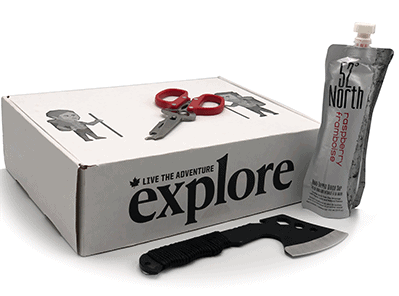 Designed by pro dog-handlers, it's a must for a hiking doggy duo. These 20 hikes are just the start of your outdoorsy adventures. 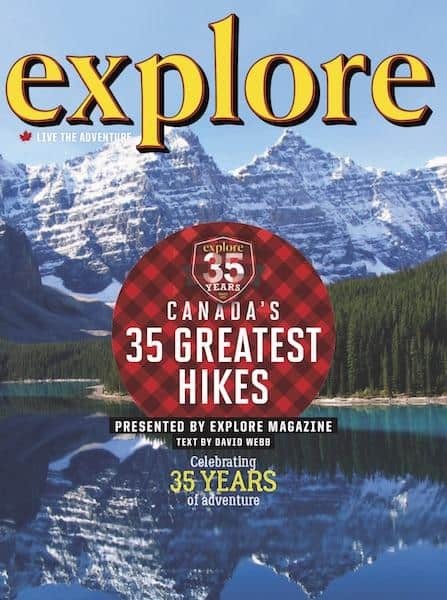 How would you like to discover detailed information about 35 MORE hikes? From all across Canada? With detailed route info, difficulty levels and stunning photos? You have the best gear for yourself—but what about your dog? 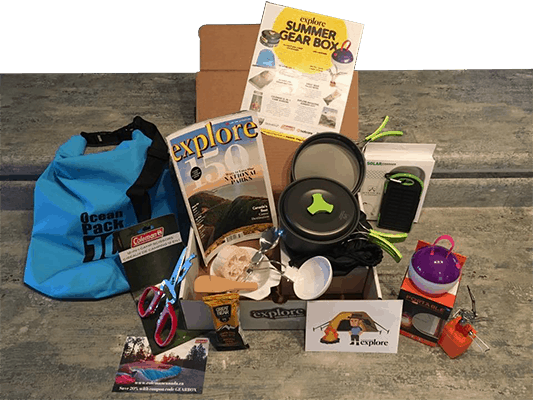 Kevin Callan digs into some great finds from Ruffwear. 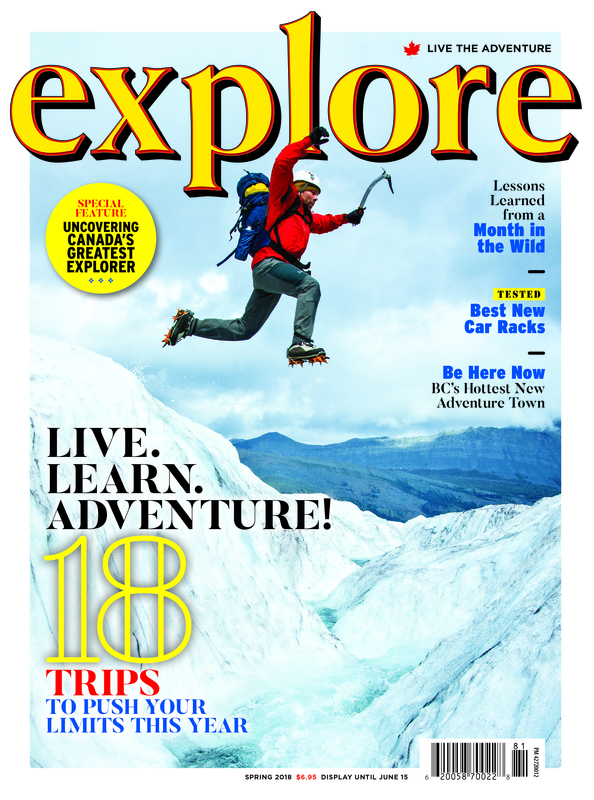 Are you headed out on a day-hike? This is your essential checklist of the gear you'll need for a safe and successful hiking trip.